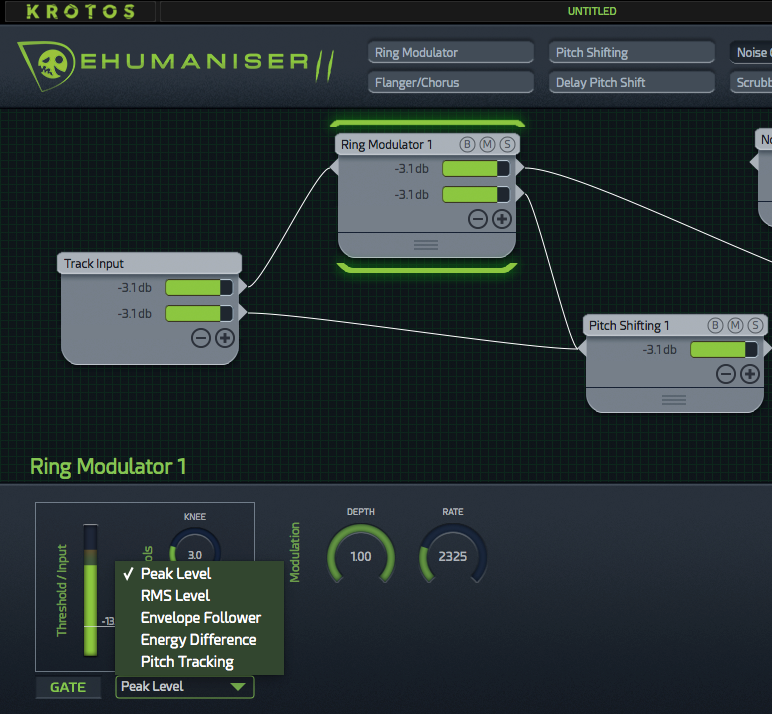 Dehumaniser 2 by Krotos is a Virtual Effect Audio Plugin. It functions as a VST Plugin, an Audio Units Plugin and an AAX Plugin. Windows: this software requires a computer with a minimum of 2.4 GHz Intel Dual Core Processor, 4 GB of RAM, and the operating system Windows 7 or above. Dehumaniser 2 requires a screen resolution of 1280×1024 or higher. Mac: this software requires a Mac Intel computer with a minimum of 2.4 GHz Intel Dual Core Processor, 4 GB of RAM and the operating system OS X 10.8, or later. Following the success of Dehumaniser, comes Dehumaniser 2. 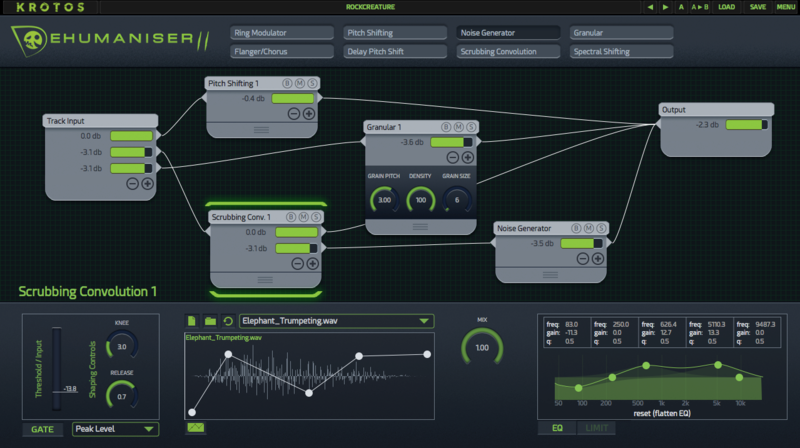 Now completely redesigned, using a truly modular, node-based system, and available as a VST/AU/AAX plugin. Dehumaniser 2's sound engine has been completely redesigned, with improved algorithms and optimisation for DAWs. It also includes new effects like Flanger Chorus and Ring Modulators. Now, not only will your monsters and demons come to life in real-time, but aliens, robots, music tracks and sound effects are waiting for you too. Re-written from the ground up, with improved algorithms for all modules. Use Dehumaniser 2 in your sessions in industry-standard DAWs including Pro Tools, Logic, Reaper, Live, Cubase and Digital Performer. Perform live directly in your session to HD video. Run multiple instances of Dehumaniser 2 on different tracks or buses. 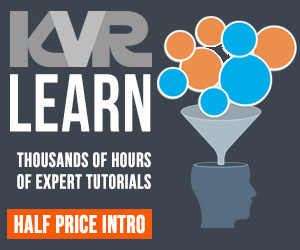 Automate hundreds of parameters for unprecedented control over your processing and workflow. Midi control, assign and recall. Create serial and parallel signal paths with a click of a button. Design complex and dynamic inter-connecting systems of processing quickly and easily for unique sound design setups. Recall these routings as presets. Clearly see the layout, gain structure and architecture of complex, dynamic audio routings. Switch between routing and mix view on the lower panel. Use up to two instances of each node; use multiple pitch shifters, granular processors, spectral or convolution processes or more in complex serial or parallel signal paths. Mute, Bypass and Solo per node. Assign and create macros per module using our new collapsible 'drawer' system. Activate and manage your license online with an iLok account or with a dongle. Move your copy of Dehumaniser 2 between studios and sessions with ease. 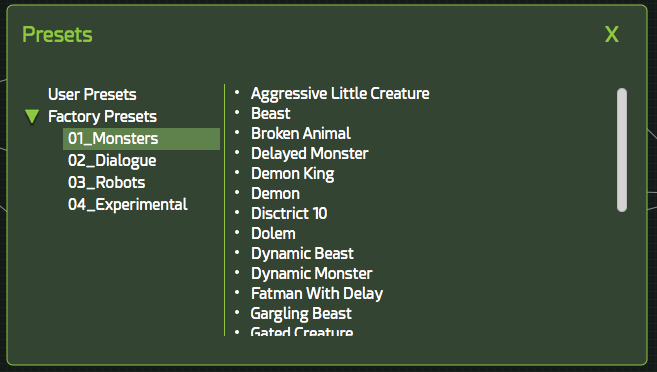 Our factory library ships with a range of monstrous presets for quick setups and to inspire your own design. Jump straight into creature design or use these to inspire your own settings. Includes over 100 high-quality animal recordings to include in your setups. Trigger these samples based on amplitude, pitch or from a range of audio descriptors. Rare and unusual animals like Bengal Tiger and Panther, as recorded by our sound recordists in Thailand. Import your own sounds into the software. New processing modules, including Flanger Chorus and Ring Modulation. Speech is also far more intelligible that in previous versions. EQ and Limiters per module (including input and output). Custom 'drawer' macro system per node. 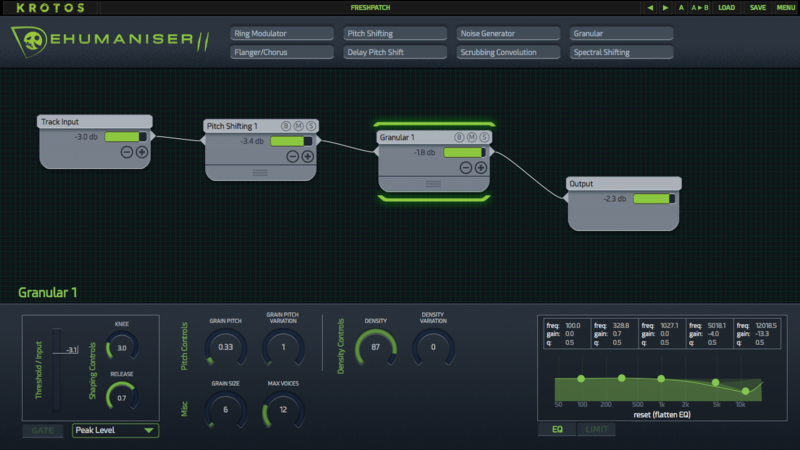 Envelope-follow based on pitch or noise content as well as amplitude, per module in your custom system. Use multiples of the same module to create complex settings. AAX Native, AAX AudioSuite, VST, and Audio Units (AU). Supported sample rates: Minimum: 44.1 kHz, Maximum: 192 kHz. An iLok account is required to activate and use both the demo and full version of the software. Pro Tools (10.3.5 or later), Logic Pro X, Nuendo, Live, Cubase, Digital Performer, Reaper and other VST/AU supporting hosts.